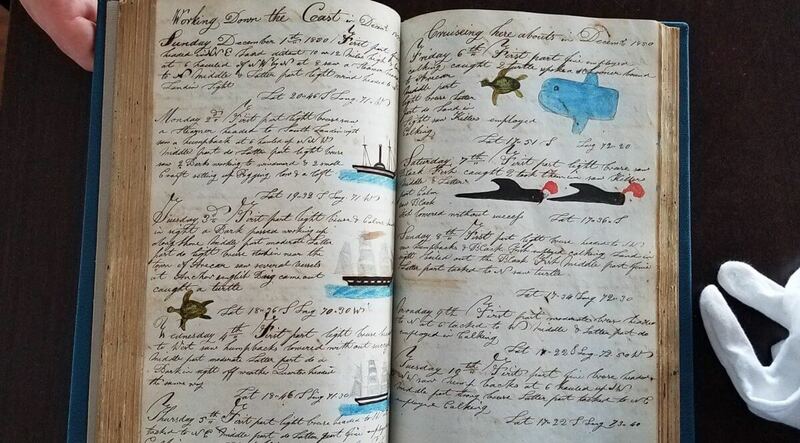 NANTUCKET, MA – The Nantucket Historical Association (NHA) is pleased to announce the major acquisition of the Josiah C. Long logbook from his 1848-52 voyage as captain aboard the Nantucket-built whaleship Charles Carroll. This is a rare logbook and in excellent condition. The acquisition is possible through the generous support of the Friends of the Nantucket Historical Association. This logbook complements existing items in the collection. The Charles Carroll was built at Brant Point in 1832, and Obed Macy, a noted Nantucket historian, attended the ship’s launch, describing the event in his private journal, now in the NHA collection. The NHA holds Owen Chase’s log from the Charles Carroll’s second voyage (1836–40); a log from the third voyage, under Captain Thomas S. Andrews; and the first mate’s log from the fifth voyage. Owen Chase, famous as first mate of the Essex, was an original part owner and first captain of the Charles Carroll. He spent seven and a half years in command, taking the ship to the Pacific twice. Support from the Friends of the Nantucket Historical Association has enabled the NHA to acquire numerous artifacts, works of art, and documents, and to ensure that such objects stay on or return to Nantucket to be enjoyed by the people of the island. The organization has also supported such projects as the construction of the Gosnold Center; the conservation of artifacts; and the restoration of the parlors in the Hadwen House.